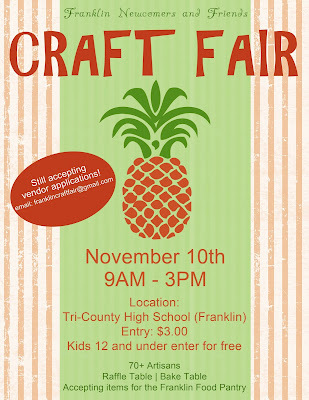 The Franklin Newcomers and Friends 45th Annual Craft Fair is coming up. Come get a start on your Holiday Shopping . . . or find the perfect birthday, anniversary, housewarming, etc ... gift. The Craft Fair will be held on Saturday, November 10 from 9 AM to 3 PM at the Tri-County High School, 147 Pond Street, in Franklin, MA. All proceeds go to local charities. In addition to the Artisans we will have a Bake Sale Table, Raffles and we are accepting donations for the Franklin Food Pantry. Interested Crafters of handmade items are welcome to request an application by sending an email to franklincraftfair@gmail.com. Get a First Look at FPAC’s Virginia Woolf?